To provide convenient and secure mechanisms for managing and exchanging information in the educational environment. Based on NFC technology for secure authentication, the proposed solution integrates daily education activities into a single intuitive application: secure access to digital resources stored in the cloud, student attendance control, Close-loop payment integration, reliable on-line exams, retrieval of examination grades, transportation, secure access to college facilities, among others. We did this by creating a smart tablet-based platform dedicated to lifelong learning. 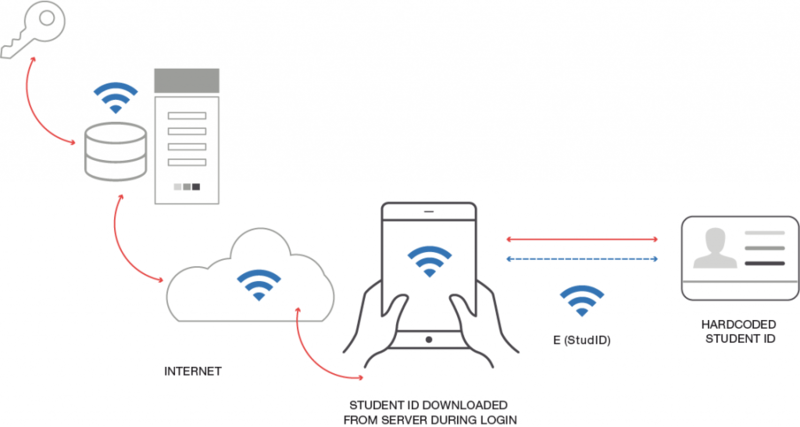 It consists of an Android application that offers both students and professors access to education functionalities and a back-end server which stores security credentials and resources on the cloud. Students and professors use a smartcard credential to authenticate themselves against the back-end server and obtain access to the educational content. The Android application offers both students and professors access to the education platform. A web service in PHP using a MySQL database stores the digital resources and credentials. End-to-end security is guaranteed by protecting the communication channel between the smartcard and the server using AES cryptography. The smartcard credentials are based on MIFARE® DESFire® EV1. Physical resources such as books are tagged with an NFC tag, NXP NTAG203. When tapping a resource against the tablet, it is uniquely identified and, if the user has the required permissions, downloaded into the educational application platform.